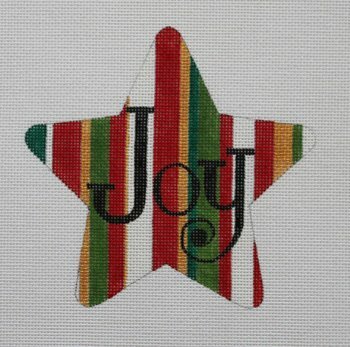 A Christmas JOY needlepoint star ornament by Raymond Crawford sold canvas only or with fibers. If you order cotton we will send DMC cotton floss; for silk we use Pepper Pot single ply silk; for mixed threads M - we will send mainly silk and a smattering of metallic threads for holiday sparkle. If you want to hold the canvas taut on a frame while you stitch it then we recommend two pair of 9" stretcher bars and some thumb tacks. Usually ships within 1 week - if it is out of stock we will let you know.